I admit I am not excited about eye creams and it is a step in my routine that often gets forgotten. I am trying to get better at applying them. I prefer a product without the bells and whistles. I just want to maintain the area by keeping away dryness and eczema. I am not overly bothered about dark cycles, I do have them but I do not consider them a major concern. You may or not know that I was using Green People night eye cream. I think it is a good, inexpensive cream but when it ran out I decided to try something new. I am very fussy about how much I spend and wanted to keep on budget, £10 was my limited. 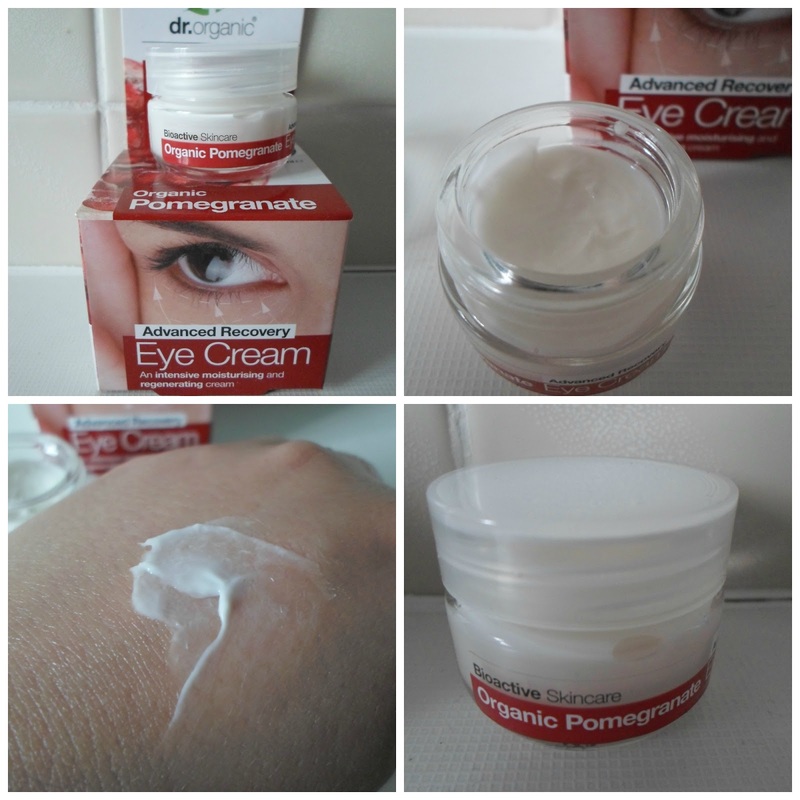 You all know I like Dr Organic Pomegranate Face Cream so that was a good enough reason to buy the matching eye cream. Dr Organic Pomegranate Advanced Recovery Eye Cream claims to help boost collagen stability, reduce fine lines, wrinkles, under eye puffiness and dark circles and promote cell regeneration. It is free from parabens, SLS, artificial colours, harsh fragrances and preservatives. The active ingredients are pomegranate, aloe vera juice, mango butter, beeswax, buckwheat extract, green tea extract, CO-Q10 and cotton seed oil. I think this eye cream has a nice thickness which you can dab or layer on, either way it’s adaptable and comparable with Green People. The downside for me is the teeny tiny pot, not ideal for fat fingers and long nails and I definitely prefer a tube. Despite this little annoyance, I do like this cream. It sinks into my skin easily and I feel as if my skin looks brighter and plumper with every application. I don’t think it makes a dramatic difference to my dark circles but maybe I’ll change my mind when I have reached the bottom of the jar. If you would like to give this eye cream a whirl the Dr Organic range is exclusive to Holland & Barrett. I cannot remember the exact price I paid but it was under a tenner. H&B always have good offers so you can probably grab for less if you are in there shopping for other items. I did do a blog post featuring eye creams under £10 so if Dr Organic does not appeal check that out. Have you tried this eye cream or do you have a favourite to recommend? I love pomegranate in skincare and Weleda's range is a favourite of mine. They do a pomegranate eye cream that you might like, if you aren't intolerant to their products. Essential Care don't do eye creams which is a shame. I love their avocado replenishing cream. Nor do another favourite organic brand, MuLondon. Although the latter may be doing them in the future. Pai do them, although I haven't tried it myself. I don't feel the same way as you about the fragrance of the Pomegranate products, I like them, so I guess you should avoid this one.